For about a year, I spent a lot of time scouring the “buy, sell, trade” sections of forums and eBay looking for these shoes in my size. I was reluctant to spend the $895 for the shoes and was adamant on trying to find them used for cheaper. Problem is, I have small feet and trying to find a size 7US was near impossible. I only saw one listing and I was not blessed by the eBay gods that day. I ended up losing the auction by just a few dollars. I felt more and more inclined to pay the retail price as the months past by. 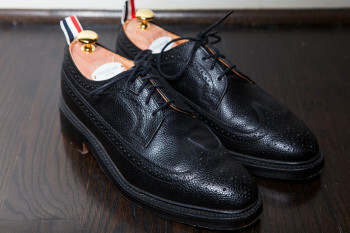 On October 30, 2013 I finally made the plunge and enlisted in the Thom Browne army. 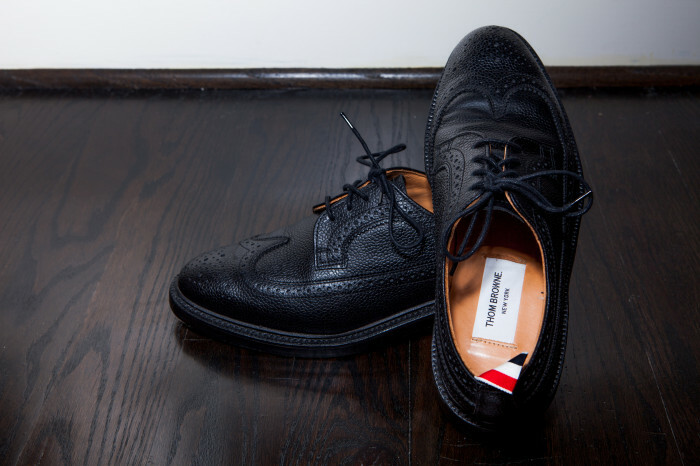 Thom Browne’s iconic aesthetic would not be complete without a pair of the all black, chunky, grosgrain back tab, calf pebble grain longwings. 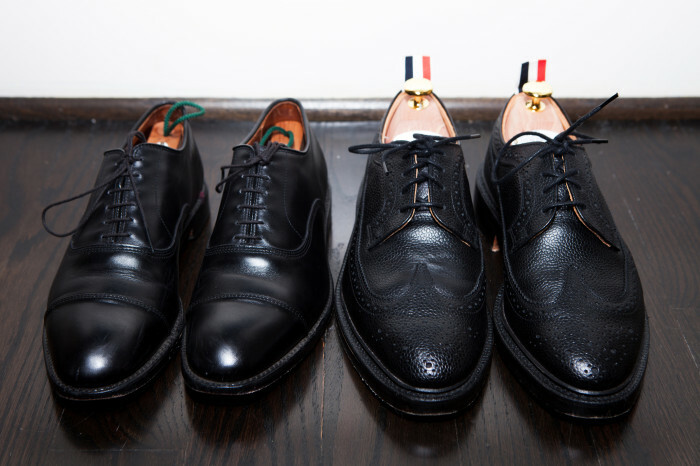 The shoes have been manufactured by Sanders in England since 2011 (Tricker’s prior) and built like a tank. Honestly I have never owned a shoe that was as solid as these. For the record I am wearing the shoes as I write this review. My first impression wearing the shoes were that they were mostly comfortable to wear sock-less out of the box, although I wouldn’t wear them without socks because I don’t want to ruin them with sweat. 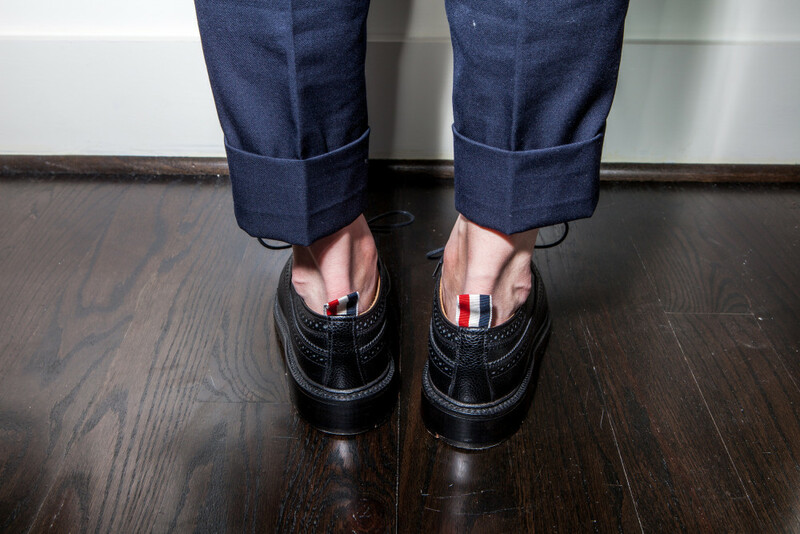 Instead of going sock-less I opt for no-show socks instead. The one thing that did bug me was the shoe rubbed against my ankle a bit. It wasn’t quite enough to get blisters but they broke in after one wear. Because of the metal taps, I have only worn the shoes a total of 12-15 times since I purchased them. The shoes make quite a bit of noise, especially when I walk through my tiled floor office, making me seem like a tap dancer. I wore them to the office once and my boss forbade me from ever wearing them to work ever again. Instead of describing how chunky they really are, I figured a picture would be better. 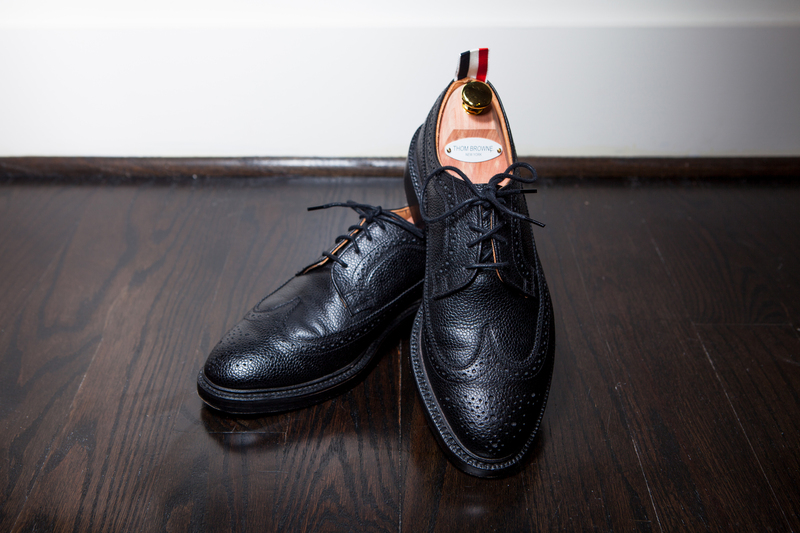 Next to the longwings are Allen Edmonds Park Avenue captoes. 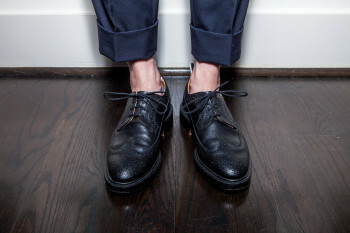 Just in case you were wondering, I wear a 7D in AE and a 7US in Thom Browne. What surprised me is both shoes fit almost exactly the same even though the Thom’s look gigantic. 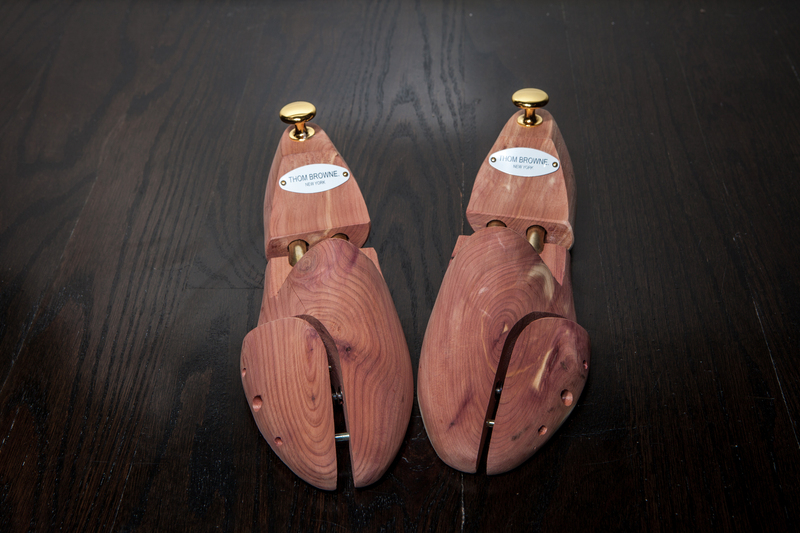 Inside the box you have shoe bags as well as European spring cedar shoe trees. I was disappointed that the shoe trees were not lasted, since the shoes themselves are $895, but that’s alright, it’s not a huge deal. 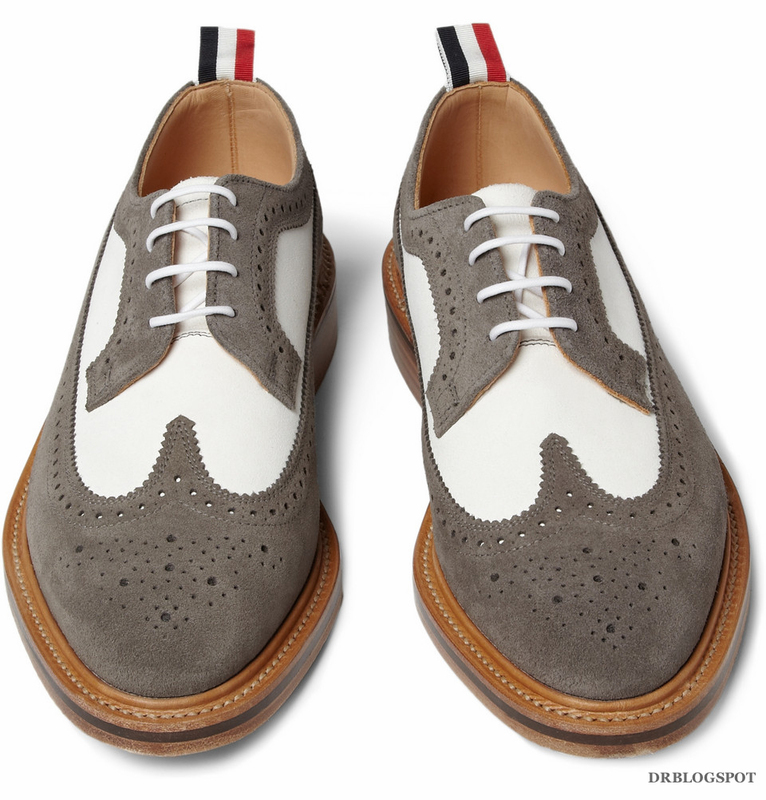 The longwings are definitely a staple item if you are trying to get into the Thom Browne aesthetic. They also come in a chestnut well as a chocolate brown. 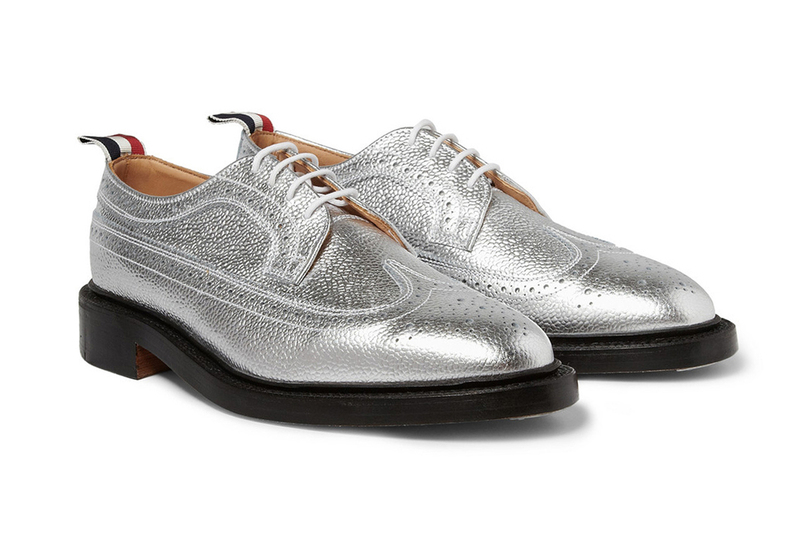 Each season, Thom also releases seasonal pairs as well, like metallic or suede ones longwings. 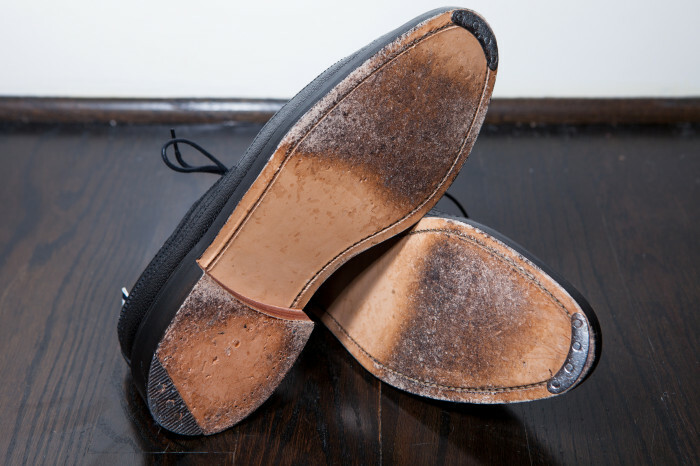 Another option you have year round are the crepe soles with come in both black and chocolate brown for $1000.